This is the first solo exhibition of Ivri Lider – one of Israel’s most prominent musicians, who in recent years has expanded his creative practice to photography. 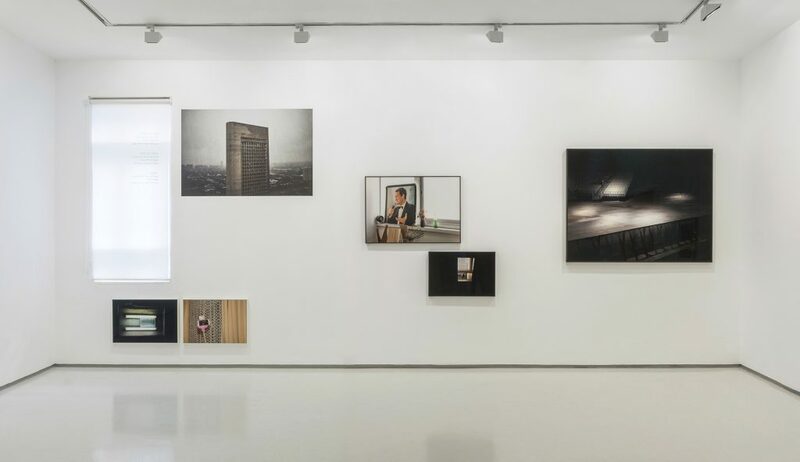 Lider began exhibiting about a year ago and since then, his works have been featured in several group shows, including at the International Photography Festival and the Eretz Israel Museum in Tel Aviv and Berlin’s Dittrich & Schlechtriem Gallery. Lider has been in the public eye as a writer and musical artist for over two decades. In a way, the tension between his maturity as an artist and the fact that he is now taking his first steps as a photographer is the origin of some of the most interesting aspects in his visual art. Unexcepted and surprising, seemingly conflicting combinations, which can be found in his personality as well as in his art – both musical and photographic: strength, confidence, and abundance alongside fragility, hesitancy, and melancholy. For me, these combinations – presented with tenderness, sensitivity to detail, and emotional and aesthetic precision – are what make him a fascinating artist in the various media he chooses to practice. 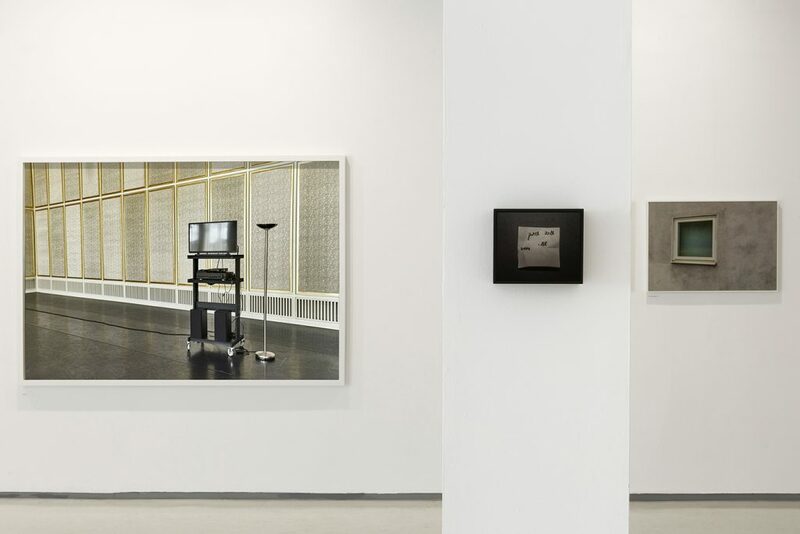 The exhibition itself is also divided into two complementing parts. 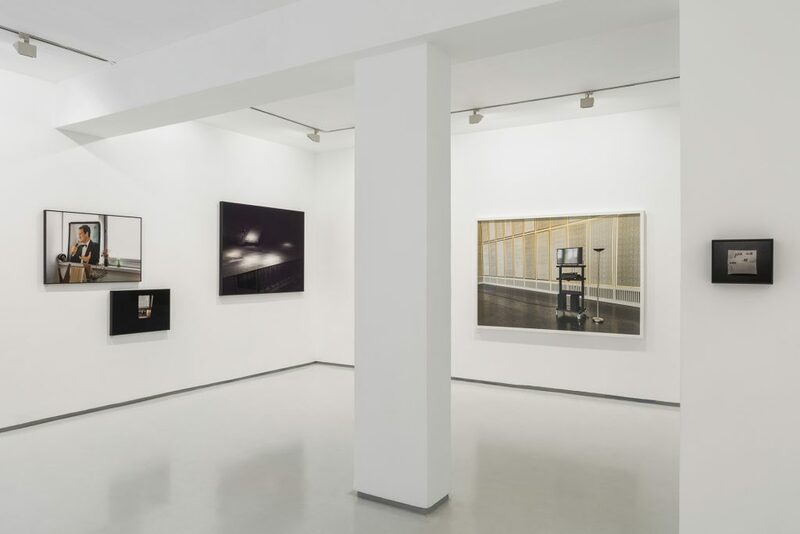 The main, “legitimate” gallery space features photographs chosen from the numerous works Lider has taken in recent years. The pieces capture what looks like random moments, a glimpse into fragments of life – compositions drawn from the jumble of everyday life, which trigger curiosity as to the place and the situation in which they were taken. Lider deliberately does not satisfy this curiosity – neither in the scenes themselves, nor in the works’ titles. Most of the photographs are executed with technical perfection, with a great emphasis on clean frames and symmetry (and in the few cases that is not so, for instance in the work Happily Ever After, the blurring is clearly intentional). The heightened aestheticization of the works is even more evident given the photographed objects, which in many cases are nondescript or insignificant. 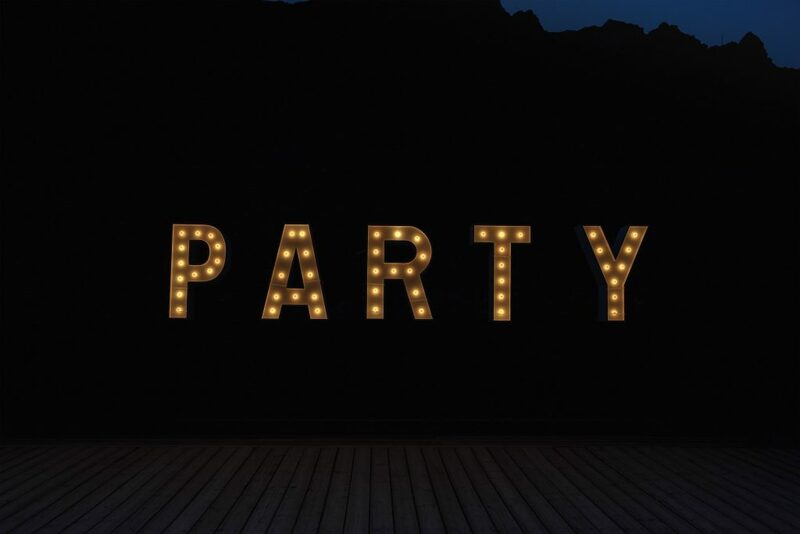 In the same way, we are only exposed to the supposedly marginal, hidden parts of the scene, while many of the photographs in fact portray places that can be considered glamorous and prestigious, like luxury hotels or spacious concert venues, exposed in all of their wretchedness. Another recurring characteristic in the works is texts that appear as part of the scene, imbuing it with another layer of meaning. Naturally, the use of text is associated with Lider the lyricist, underscoring the connection between the different creative disciplines he works with. 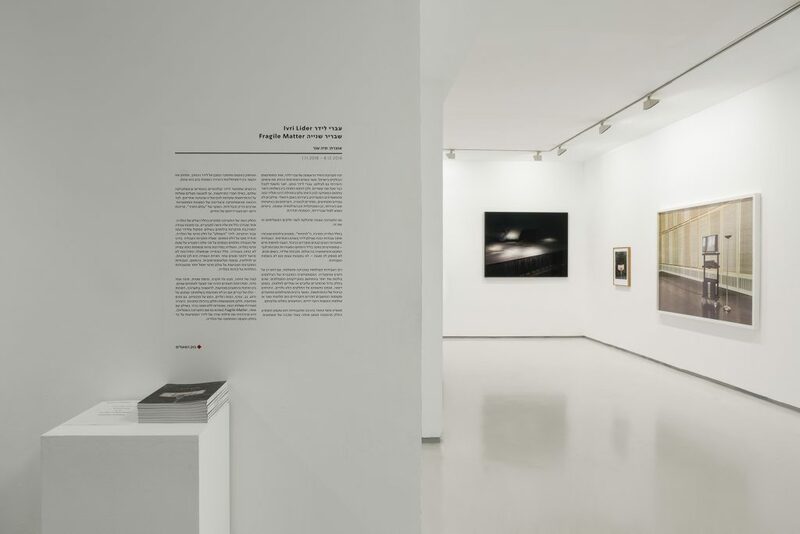 The exhibition’s title in Hebrew is Split Second (the Hebrew word for split is also linked with the word for fragile). This is also the title of two central works displayed in this part of the exhibition (which were given the names Socializer and Water and Concrete in English) – each holding both poles between which the entire exhibition unfolds. Socializer captures an unclear, almost surreal moment: a TV monitor, a sound system, and speakers sitting on a cart besides a floor lamp, on the backdrop of a wall made up of endless golden panels. The decision to display it in the exhibition in such large scale attests to its central role in the story. The grandeur is alluring and intriguing, yet seems forced in the detached situation, leaving a sour sense of confusion and loneliness. 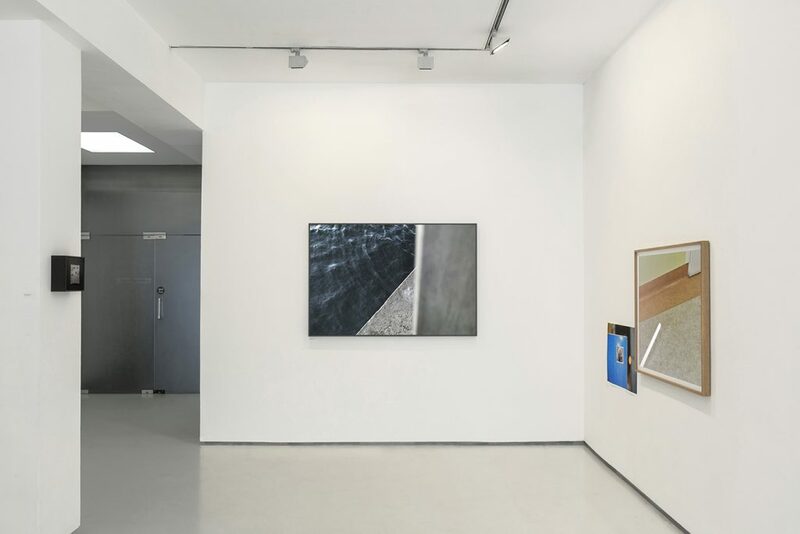 Water and Concrete freezes a moment in time that holds several potential interpretations, which largely depend on the viewer himself and his worldview. 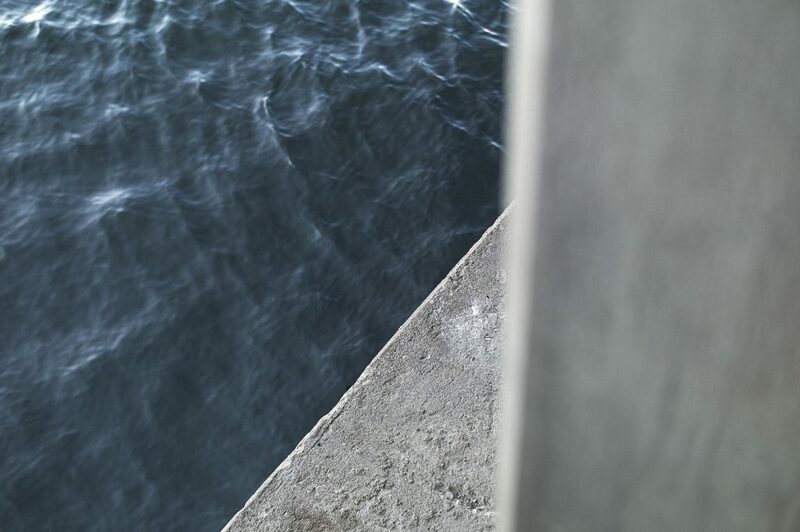 The almost abstract photograph captures an encounter between sharp and rigid concrete, water in motion, and another, ambiguous object on the edge of the frame. Alongside the beauty and poetic nature of the work, and the almost meditative feeling it evokes, it seems to represent a journey that shifts between transcendence and harmony to disappointment and despair, which is woven throughout the entire exhibition. In most of Lider’s works in this part of the exhibition, and in most of his works in general, there are no human figures. 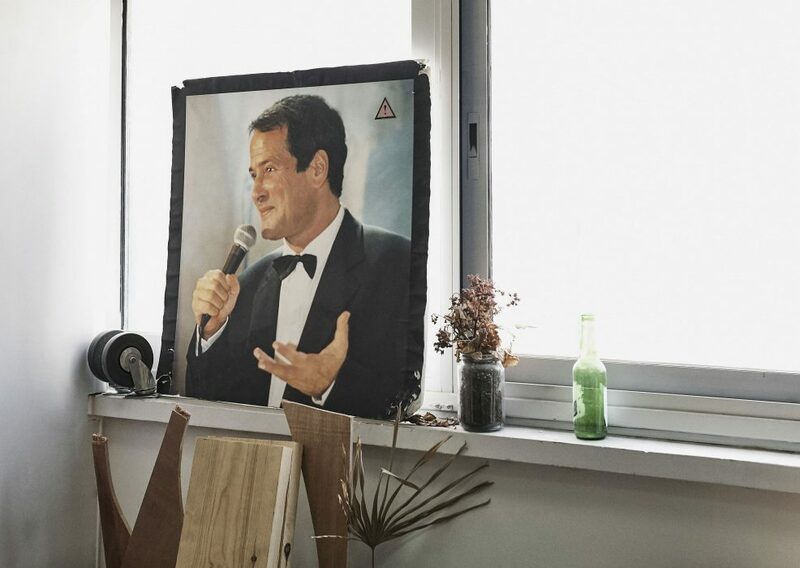 The only figures that appear in the works are part of a photograph within a photograph (in Happily Ever After, Change, and Privet Kiska), or in the piece Entertainer, which depicts a peeling painting of Dudu Topaz – the number one entertainer in Israel throughout the 1990s, who spiraled into a mental breakdown following his fall from grace – until his arrest and tragic end. The figure of Topaz appears as part of a multi-object scene, which at first glance looks like a random mixture of items. A second glance reveals that each of these objects imbues the work with another meaning, another warning, almost as if they were symbolic religious objects in Christian iconography. The moments that Lider documents are cinematic in their nature and aesthetics; While seemingly noneventful, they bring to mind questions about the events that preceded them and those that followed them. Alongside the aesthetics and tenderness of the depicted scenes lurk emptiness and loneliness, the falsity of the “rich and famous” lifestyle, the elusiveness of the everyday, and the fragility of life. The second part of the exhibition takes place in the upper space of the gallery, an area that is usually closed to visitors. The work presented there is comprised of a projection of photographs with a soundtrack composed by Lider specifically for the piece. Lider “took over” a private part of the gallery, setting up a screen on the storeroom door, on which the work is projected. On the way to the work, viewers pass a sign that points to a private space in the gallery, while the climb up the narrow stairs forces an uncomfortable viewing of the projection. The space at the top of the stairs is not intended for more than one person. 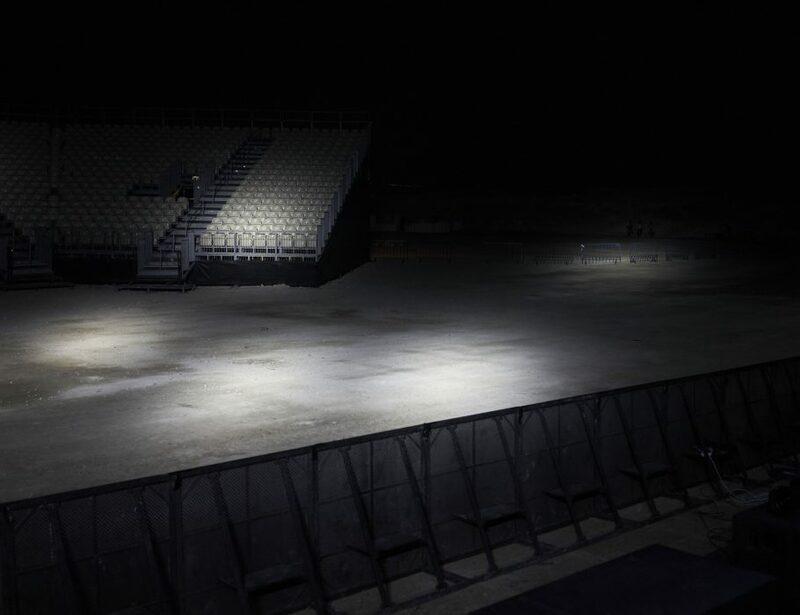 The viewing experience is therefore private, or alternatively – crowded and claustrophobic. Accordingly, the projected works unfold a darker, more private world than the works hanging on the walls of the gallery. An edge of a bed, a view of a ceiling, a fragment of a carpet, a corner and an angle, dark corridors and slivers of light emanating through different cracks. Amongst the corners and objects, for the first time in the exhibition, we see figures – all men, who also do not fully appear: a tattoo on an arm, a back, a neck, feet, a stain on a pair of shorts. There are also faces, some blurry and others distinct and recognizable. The piece evokes many questions, left without a clear answer. In conjunction with its title, Fragile Matter, it echoes the lyrics of Lider’s song, which appear on a fabric on the window of the gallery’s bottom floor.